1. Unknown Smith m. 2. Cyntha (?) Unknown in Greeneville, TN. They had nine children. 3. Martha Smith appears to be the 6th child of 8 Children. Martha is a brick wall for me. There appears to be some promise in using a FAN Club approach to breaking this wall down. FAN is the acronym for Friends, Associates and Neighbors and was coined by Elizabeth Shown Mills. The idea is to research a subject’s FAN Club in hopes that one or a combination of records will give you the evidence to make the connection to the next generation and break down your brick wall. 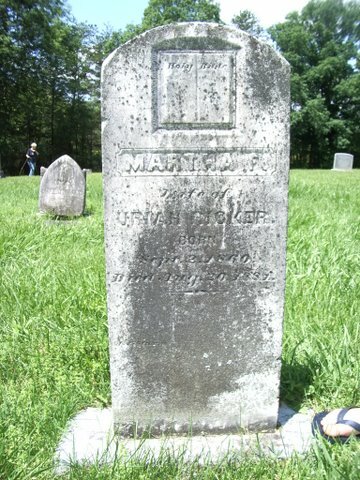 Martha, not yet 21, died in 1881 when her only child was not yet 2. I believe her son, Smith A. Ricker from the 1880 US Census, is the same as Smith [Alexander] Stills found in the 1900 US Census and is my documented ancestor. Vitals: Her birthdate comes from Find A Grave and is not properly sourced. Her death also comes from Find A Grave. The date given is 20 Aug 1881 and is also not documented. The last know document is the 1880 US Census. Parents: Her parents are unknown. We have an 1870 US Census which gives us a potential name of Cyntha and a bunch of siblings. These is the start of using the FAN Club﻿principle which also applies to Family members. You could say that the FAN Club principle is really the FFAN Club principle to remind you to explore both Families and Friends. Spouse(s): We have her marriage to Uriah M. Ricker. Given her age at death and the 1880 US Census we can reasonably conclude that this was her only marriage. Children: The 1880 US Census gives us only one child, she could possibly have been pregnant at the time of her death but no evidence has been found to suggest this possibility.